All the Canary Islands have UNESCO Biosphere Reserve status covering part or all of each island, but I haven’t seen anywhere on any of the other islands where the hand of man (‘hand of humans’ just doesn’t roll off the tongue the same) is quite so perfectly in symmetry with that of the natural landscape as it is on the coast in Fuencaliente on La Palma. What’s remarkable is that neither man nor nature’s handiwork stretches back too far into the past. 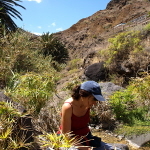 Two volcanoes have shaped this southern tail of La Palma, the San Antonio volcano which erupted in the 17th century and the Teneguia which blew its top to add new land to La Isla Bonita in 1971. Surrounded by a violent landscape, but miraculously untouched by the lava streams which bubbled and hissed their way towards a cooling sea, is the antigua faro, a beautiful lighthouse built from blue stone from Gran Canaria at the end of the 19th century. 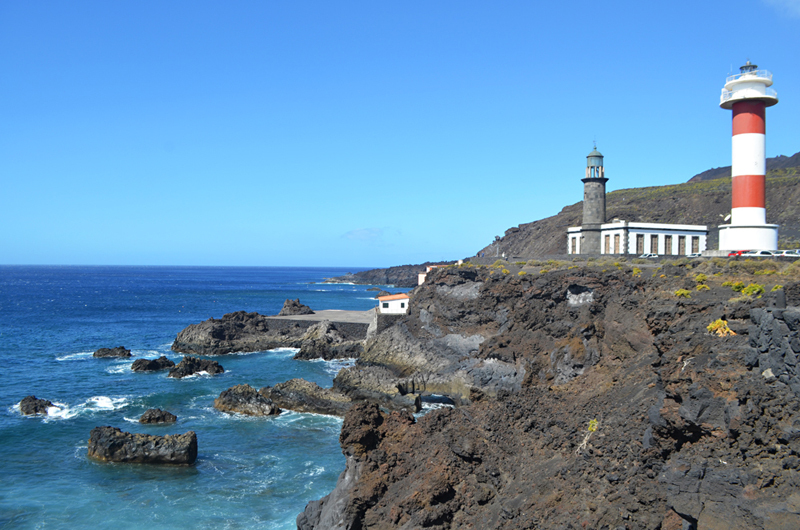 The lighthouse is home to the Interpretation Centre for La Palma’s Maritime Reserve – closed when we visited. Beside it is a second, newer lighthouse. Lovely though the lighthouses are it’s another man-made creation which draws the eye, the salt gardens of Fuencaliente, better known as Las Salinas, the salt pans. Amidst the shallow basins white, glistening mountains mimic the shape of the red volcanic cones which characterise the landscape just inland. Their existence could have been disastrously short-lived. 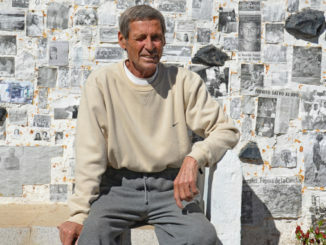 The dream of Don Fernando Hernandez, they only opened for business in 1967, four years before nature almost threw a spanner in the works in the most unexpected and spectacular fashion. Who would take account of possible volcanic eruption in their business planning? 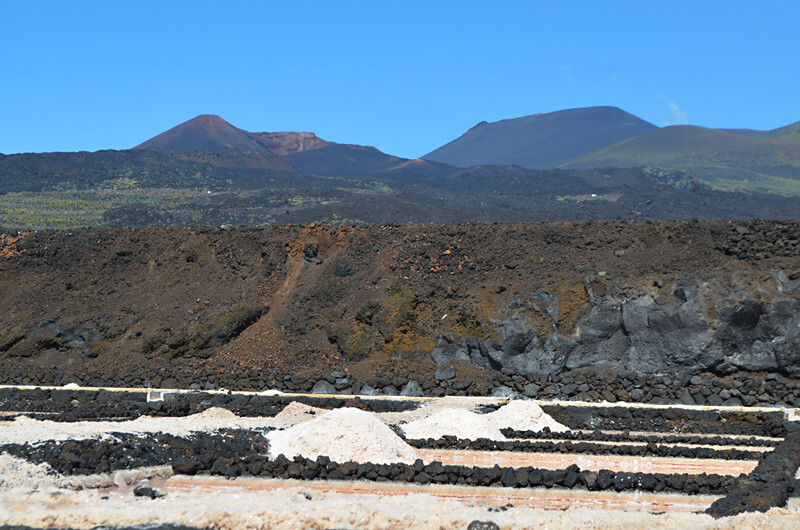 As it happened Las Salinas was spared although the eruption suspended production for a year. 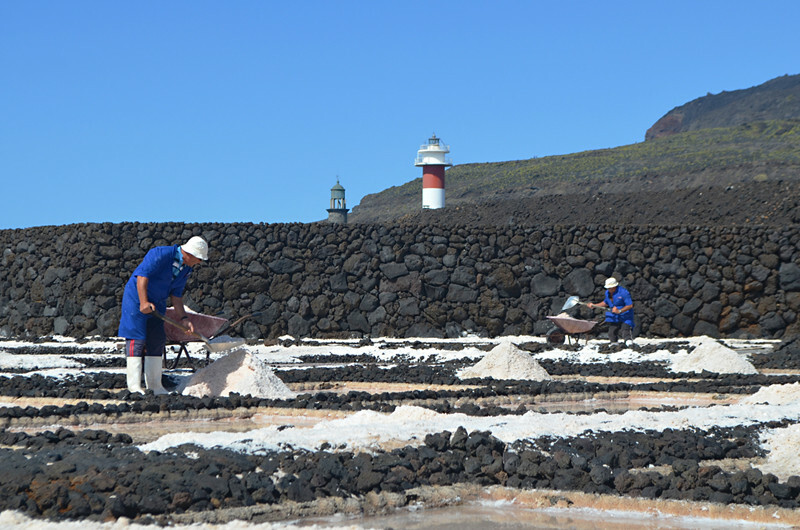 Three generations later they’re still in operation and looking as strangely stunning as ever – a friend described a photo of one of the series of salt pans as looking like ‘a seaside chocolate bar factory for sweet-toothed giants’. 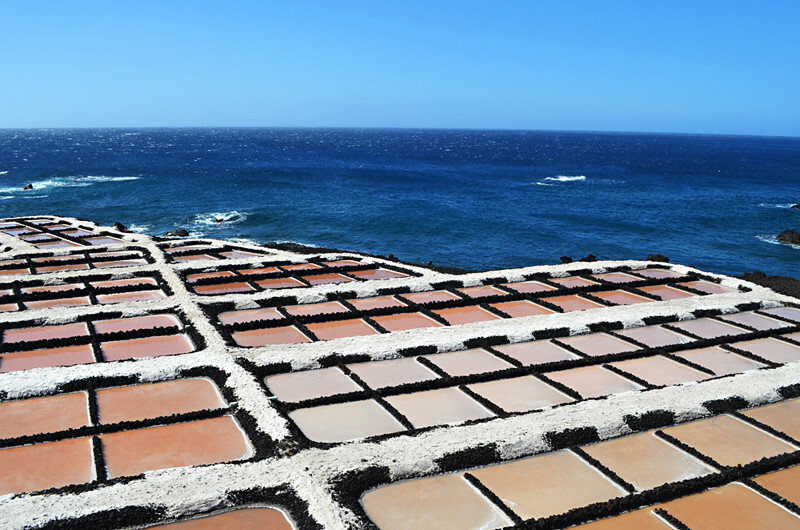 I’ve seen salt pans in other locations but none with such a range of colours as those at Fuencaliente. Last time we visited the area it was at the end of a walking route which brought us from the San Antonio Volcano outside of the town of Los Canarios. We ended our route and caught a bus back to our starting point with only time for little more than a brief glance at the salt pans. 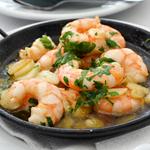 This visit we were staying at the Hotel Teneguia Princess just down the coast and had time on our hands before lunch at the Restaurant Jardin de la Sal overlooking the sea. There’s a convenient and interesting self guided route around Las Salinas with info boards in Spanish, English and German. The route is supposed to take around 30 minutes, it took us quite a bit longer. Las Salinas are simply bewitching. 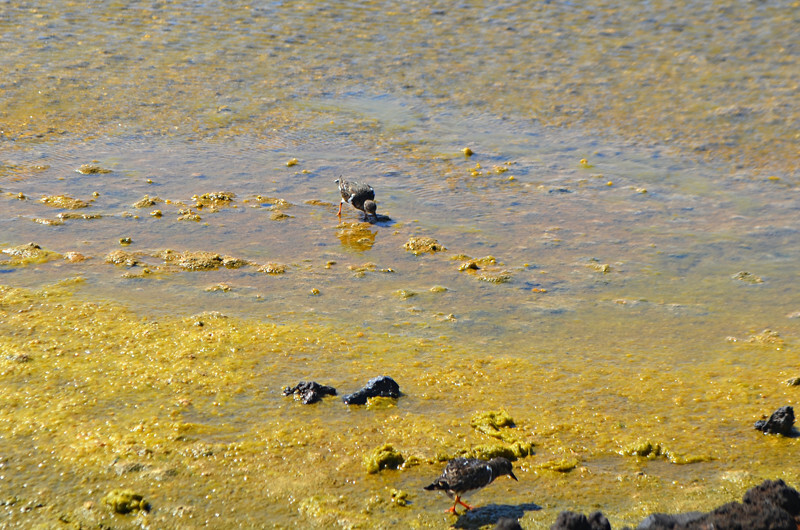 Some are filled with red water, caused by an algae that in turn feeds crustaceans which in turn attracts migratory birds; between 30-50 species including plovers, sandpipers turnstones, shelducks and even the occasional passing flamingo. 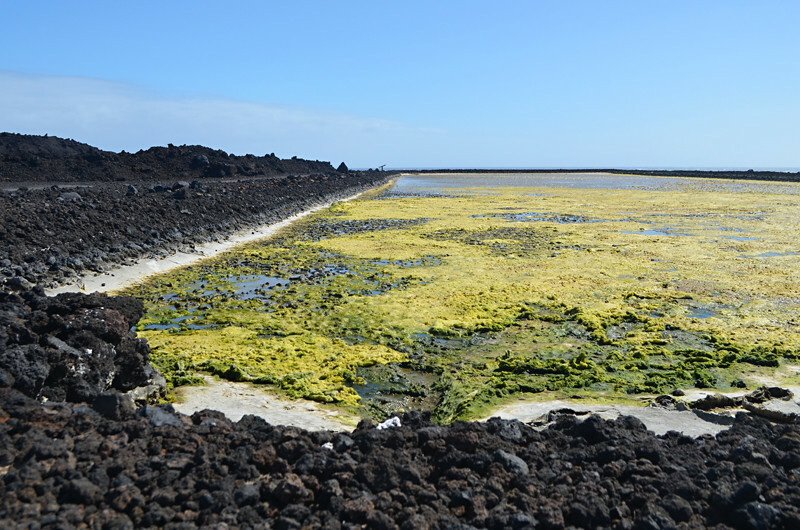 Sun and wind are necessary elements for salt pans and true to form the sun was blazing whilst the wind was howling (more so than usual due to a polar weather front passing across the Canary Islands). It’s the first time I’ve witnessed birds in a feeding frenzy. An army of turnstones were feeding furiously, completely distracted by the goodies on offer to be bothered by my presence no matter how close I got. The wind nearly blowing them off their little feet didn’t prevent them from gorging with barely a pause for breath. Other pools are coated in emerald green or misshapen living rocks; all part of the process of turning sea water into mounds of rock salt. On the final section two ‘gardeners’ in blue overalls shovelled salt into wheelbarrows before dumping them into the back of a truck. The rough road leading to and from these pans was covered in salt, making it look as snow had fallen on the La Palma coast. Ironic, as the cold weather front brought real snow to the highest points of Tenerife, Gran Canaria and La Palma a couple of days later. There was a temptation to just stand and gaze and gaze over a wonderfully wild landscape where humans and nature were managing to co-exist and thrive harmoniously. 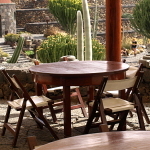 But there was one final part of the process to experience; tasting the product and it was exactly time for lunch at the Restaurant Jardin de la Sal.